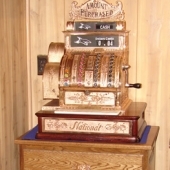 The HBAC Group takes great pride in the restored antique cash registers offered here for sale. 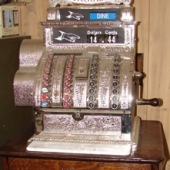 These machines are not reproductions, they are antique cash registers made before 1915. 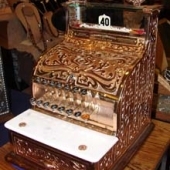 All of these cash registers are completely restored. 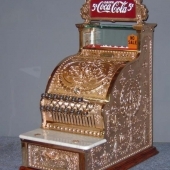 Please refer to our restoration page to see what entails a full restoration of the antique cash registers we have for sale. 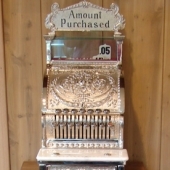 Some of the registers are offered for sale with an “Amount Purchased” sign or a customized glass sign. The glass sign can be customized to display whatever you may desire, including, but not limited to, a company logo or a family name. 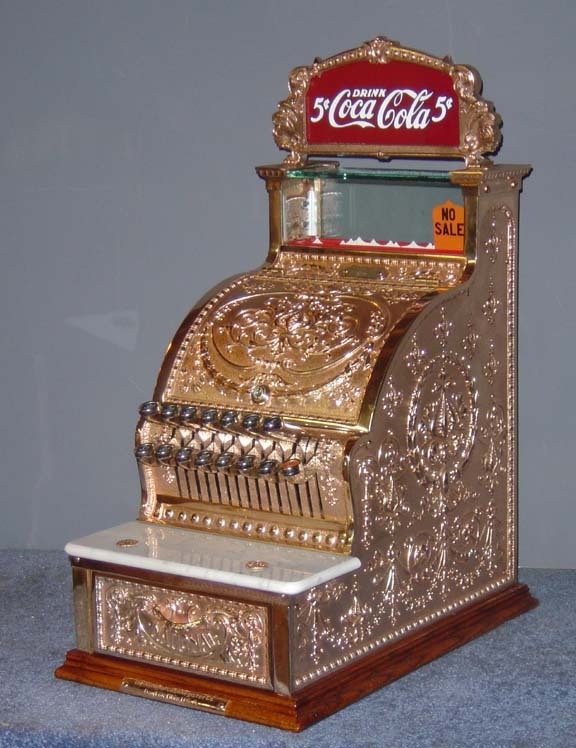 Should you have any questions, or wish to see other views of these cash registers, do not hesitate to contact us at info@hbacgroup.com , or give us a call at 607-792-3343. 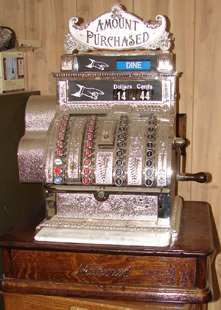 Unless otherwise specified, all of the restored cash registers are sold with a “new” top sign. The restoration process that each of these registers have gone through may have also necessitated the use of some other new parts. Prices do not include crating and shipping; however this service is available by us. The cost of shipping is usually quite reasonable, and arrangements can be made for pick up at our shop if desired. All of our registers are sold with a brief overview on how to operate the register, as well as all of the keys for the locks. 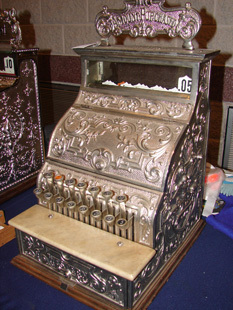 The Model 313 is the most available of the small candy-store or barbershop size registers. 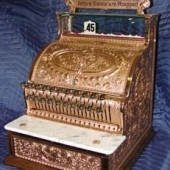 This register is featured in what some customers call bronze or red brass. They measure only 10" wide and 17" deep. They were produced from 1908 until 1915. 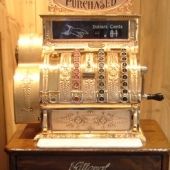 This register has a price of $2,400 with an "Amount Purchased" sign or $2,600 with a customized glass sign. 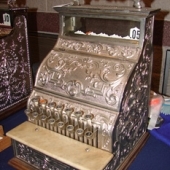 The Model 313 is the most available of the small candy-store or barbershop size registers. 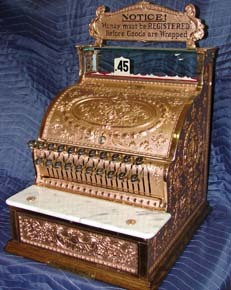 This register is featured in what some customers call bronze or red brass. They measure only 10" wide and 17" deep. They were produced from 1908 until 1915. 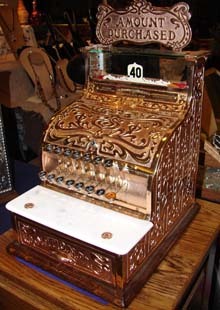 This register has a price of $2,400 with an "Amount Purchased" sign or $2,600 with a customized glass sign. 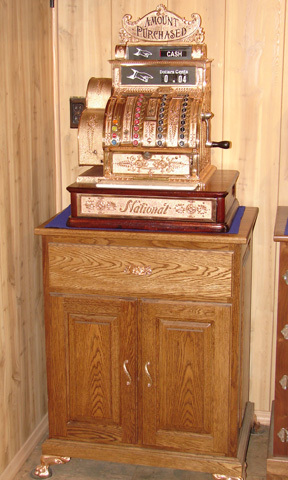 The solid oak stand pictured is also available for sale for $1,000. This model 349 in nickel plate has three "special" keys for 1/2 Pint, Pint and Quart. 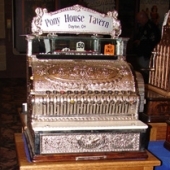 It has a mechanism to keep track of how many of each were sold by that particular tavern. The beautiful oak display cabinet that this register sits on is also available for immediate shipping. Both the glass on the cabinet, and the glass sign can be cusomized. PRICE: $2,500 with an "Amount Purchased" sign or $2,700 with a customized glass sign. The cabinet is available for $1,200. 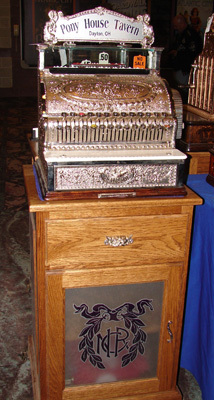 This 441 Nickel register is on a beautiful tiger oak base. It has a special key for Dine. PRICE: $2,800 with an "amount purchased" sign or $3,000 with a customized glass sign. This red brass model 421 features a mahogany base with a solid brass drawer front. PRICE: $2,800 with an "amount purchased" sign or $3,000 with a customized glass sign. The solid oak stand is also available for sale for $1,100. The model 416 was designed with a lower profile. You will notice that the "flip bar" similar to the one photographed on the register above does not exist. This register has a solid tiger oak base. PRICE: $2,800 with an "amount purchased" sign or $3,000 with a customized glass sign.